Archaic skeletons in new-animistic closets? Do we need a re-theorization of shamanism? 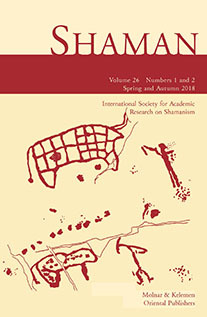 Shavante shamanism, sea diaspora and local economic development: Two comparative cases in Mato Grosso, Brazil and Xiamen, China Makris, Gerasimos P.
The personal archive of shaman/artist Jóska Soós: new insights into the early development of a shaman’s artistic language. Zoomorphic masks and masquerades in pre-modern European folklore: any real connection with initiation and shamanism? Common law customary land rights in Peninsular Malaysia: A catalyst for the resurgence of Orang Asli shamanism? Shamanistic approach to the world crises - the Yanomami Case: The end of the world or the end of another cosmic cycle? Some hypothesis about shamanic elements in the Teyyam ritual of Kerala: Is the lost nymph a shaman? Between two fires. Shamanism as a construct of Russo-Mongolian discourse in the 19th century Buryatia Alles, Gregory D.
Pandemic of Shamans in Contemporary Mongolia: Bestowal of Imagined Social Status, Disruption of Social Bonds, and Differentiation of Morality Sidky, H.
Differentiating shamans from other ritual intercessors in South Asia: A theoretical perspective Sychenko, Galina B. 9:00-9:20 Strathern, Andrew & Stewart, Pamela J. Who owns the ritual founder Lemej in the Paiwan Kulalao legend and shamanic texts? “I cannot do what they want me to do. Got it?” An alternative way of living in the shamanic intentional community of Terra Mirim (Brazil) Sheethal, V.S.